DETROIT, MI — Lisa Benson said in an overgrown alley about a block from her home on Allendale in Detroit is where a 13-year-old friend of her daughter was raped on her walk to school Tuesday morning. It’s not safe to walk alone here, says Benson, 36, whose 14-year-old daughter is a classmate of the victim at Sampson Academy, 4700 Tireman in Detroit. Benson said she or her mother usually walk the teens the remaining three blocks between her home and the school. Detroit police say an unidentified man, whom the victim reported forced her into an alley near the Interstate 96 service drive at Pacific and assaulted her, fled in a small, light-blue, four-door Ford Taurus. The teen ran to Benson’s home after it happened, Benson said. “He put her hand over her mouth and told her not to say nothing,” Benson said, “and if she did, he was going to kill her. When the teen arrived at Benson’s home, Benson called the child’s parents and police, who quickly responded with medics. The victim described the suspect to police as a 5-foot, 11-inch tall black male, medium build, with a light complexion, trimmed mustache, goatee, about 25, who was wearing a Detroit “Old English D” baseball cap, a navy Detroit Tigers jacket, dark jeans and boots at the time of the attack. View full sizeGus Burns | The Saginaw NewsEntrance to an alley near the Interstate 96 service drive and Pacific in Detroit, where police reported that a 13-year-old girl was sexually assaulted Tuesday. Detroit police Deputy Chief Benjamin Lee on Thursday said police have stepped up their presence in the neighborhood and hope it’s an isolated incident. Sampson Academy Principal Jason Patton on Thursday declined to comment about the incident and referred comment to Steve Wasko, spokesman for Detroit Public Schools, whom MLive could not reach for comment as of Thursday evening. Benson’s neighbor, Dorothy A. Gardner, 36, said she’s often on her porch and watches out for kids on their way to school, then she waved her hand across a blighted panorama from her front porch, also on Allendale near Firwood. The house next to Gardner’s is vacant, the windowless brick house across the street is vacant and another that backs up to the alley where the assault occurred is vacant. The windows there are smashed, the door open to its gutted and garbage-strewn interior. 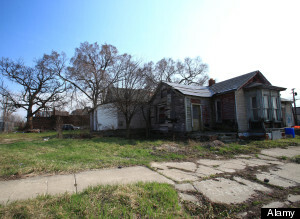 View full sizeGus Burns | The Saginaw NewsTwo abandoned homes on the corner of Allendale and Firwood in Detroit near where a 13-year-old girl reported to police that she was sexually assaulted Tuesday. Gardner has three children 15, 13 and 11, who also attend Sampson Academy. The concrete alley in which the reported assault occurred is crowded with weeds and contains various debris and litter, including several discarded mattresses and box-springs. ated, filled with unruly weeds and vacant — back up to the alley. Benson estimated her daughter passes at least 25 vacant homes during her three-block walk to school.